SoundBlaster drivers for OS/2 2.0. (C) Copyright Creative Labs , Inc. 1992. All rights reserved. (C) Copyright International Business Machines Corporation 1992. (R) Sound Blaster is a trademark of Creative Labs, Inc.
(R) IBM is a trademark of International Business Machines Corporation. 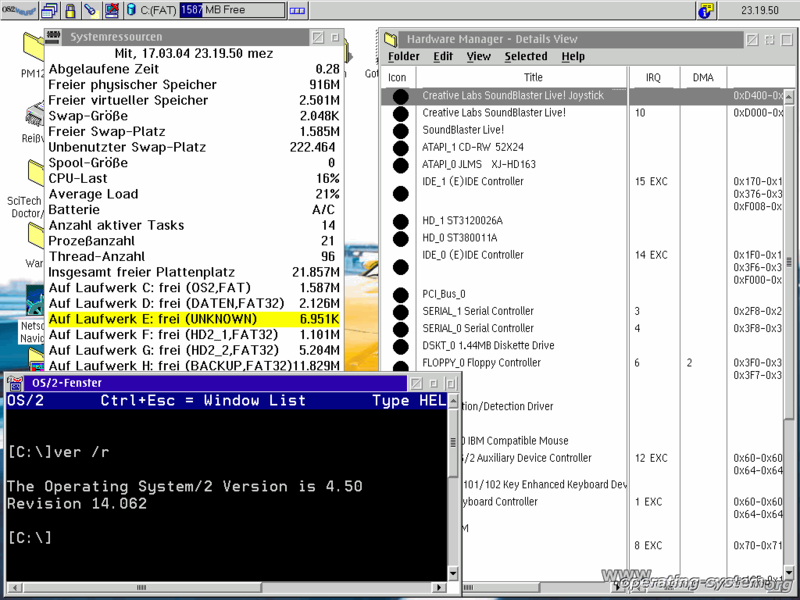 * The SBPW2.SYS device driver also supports PRO OPL/3. Multimedia Presentation Manager/2 (MMPM/2) installed on OS/2 2.0. IBM Multimedia Information Center at 1-800-426-9402, extension 160.
available through the same IBM channels as the base MMPM/2 product. prompts and reboot the system after the installation is complete. I/O=220, buffer size of 4k, and addressed as device AUDIO1$. o Sound Blaster (normal) does not support software volume control. media (part number 04G3367) or Compact Disk media (part number 04G3369). play, record, rewind, stop, pause, seek, and query status. Provides the Media Control Driver for playing and recording audio data. synthesizer support of MIDI data. it can be used to vary volume or balance over time. Driver for the Pioneer LDV8000, 4400, and 4200 series will be included. offers support for installable data handlers. and MIDI Media Control Drivers. support digital audio recorded through a microphone or line-in jack. having to reinstall the entire system. scheduling of multimedia data streams (such as audio and video). NOTE: Some applications require greater amounts of memory and DASD storage. This licensed program is available in object code only. Agreement must be in effect. transfer possession of this copy to any third party. Reprinted by permission of IBM. an extension of .WAV or .MID. "(C) Copyright (your company name) (year). All Rights Reserved." following "Statement of Service" section. be provided through the IBM Support Center. FUNCTIONALLY EQUIVALENT PROGRAM MAY BE USED INSTEAD.